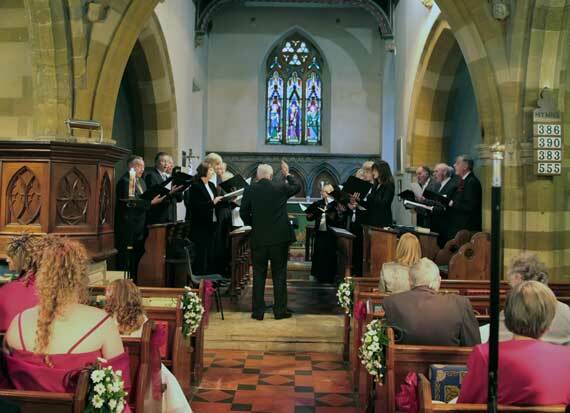 The choir is often asked to sing at events, such as charitable fundraising events, flower festivals, Christmas concerts, Weddings, community, company or private celebrations. We enjoy being involved in events within the community and will always happily do our best to put together a programme and group of singers which will suit your event. The choir's repertoire of music is wide enough to provide programmes for most kinds of occasion, whether for a full-length concert, a shorter entertainment after a meal, or as part of an event offering various performers. The choir also enjoys singing choral evensong and other church services, so if you would like us to come and sing at your local church, please do get in touch. We are always pleased to be asked to be a part of someone's special day. Inviting a choir to sing live at your ceremony or reception is a lovely way to enhance any style of wedding. We will join in with hymns as well as performing solo pieces, and can also entertain your guests whilst you sign the register or during your reception. Our musical director will be happy to work with you to devise a selection of music from our wide repertoire which will fit your requirements. Although we will always try our best even at short notice to arrange a group for you, do let us know the date of your wedding as far in advance as you can so that choir members can set that date aside. To give you an idea to help with your planning, our usual fee for a wedding is between £150 and £300, depending on the amount of music you would like and also sometimes the distance our singers will have to travel. This money goes to the choir funds to help with future concerts and membership bursaries, and not directly to our members, who give up their time to sing at weddings because they enjoy singing and helping our choir, as well as hoping that it adds to your enjoyment of your day! If you are interested in booking the choir to sing at your event, or finding out more about what we could do for you, then please e-mail our secretary, Ruth Grainger, at who will be pleased to make arrangements with you.